It's A Dan's World: THE DEAD SHALL RIDE: Ghost Rider - Spirit of Vengeance Gets Postered - UPDATED With Second Trailer! 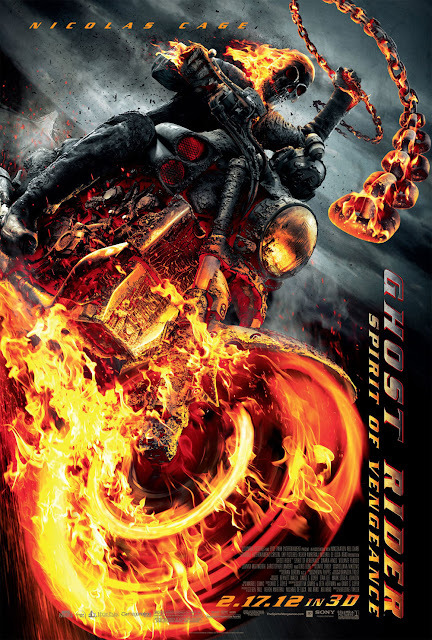 THE DEAD SHALL RIDE: Ghost Rider - Spirit of Vengeance Gets Postered - UPDATED With Second Trailer! In 2012 I just may pay my rent to the local movie theatre. Batman, Superman, Avengers, Spider-wotsit and this guy's sequel, Ghost Rider. Now with a second trailer! Judging also by this latest poster, second gear could be the trigger Johnny Blaze needs to burn his name into Hollywood. Not that the film needs a Rider mind you - just check out the detail on that bike! Not exactly the most festive of festive season imagery, but hey I ain't complaining! To relive the first trailer of Ghost Rider Spirit of Vengeance click here. finally i got me a bleedn day off! great movie poster. great movie trailer. let's hope we'll be saying the same thing about the movie it's self when we exit the theaters. i think started nodding off half way through the first one on DVD. Hey mate! Gad to see ya got a day to yourself! I'm thinkin this will be a pretty decent flick myself. And yet even though I constantly find myself saying 'G.R wouldn't do that' over and over, as a fan I find myself watching the original on DVD quite a bit. Just seeing him in 'live action' I guess. With this one looking even more realistic, I think there's a danger ol' flame head might burn out my DVD player too when the time comes.